Caley Thistle manager John Robertson is closing in on the appointment of a new captain and assistant manager. Robertson was left without a number two following the departure of Brian Rice to St Mirren last week, while the skipper’s armband has also been left vacant following the departure of Gary Warren to Yeovil Town and vice-captain Iain Vigurs to Ross County. Robertson says he has candidates in mind for both positions, and he said: “We will address that. I’m pretty sure who the new captain will be, if he accepts it. “Then obviously we have the coaching aspect to deal with as well after Brian Rice’s departure. I’ve spoken to a potential new coach who is very keen. Robertson has added five new faces to his squad and although he feels the bulk of his squad is in place for the new campaign, he says no player can take their position for granted until the transfer window closes at the end of August. 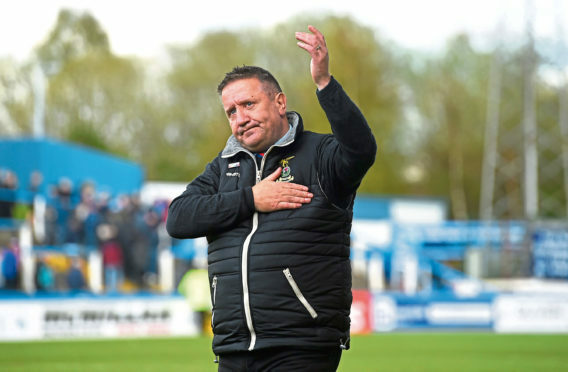 He added: “As much as that is our squad, there might be one or two lads who might not be here at the start of the season because we’re looking at them thinking they didn’t do as well as we hoped last year. “It may well be that between now and the start of the season we say ‘actually, you’re not going to be part of our plans – we need to move you on’. “That’s down to them. That’s down to how they do in these games and how they do at the start of the season. Defender Warren yesterday completed his move to English League 2 side Yeovil on a two-year contract after finalising his release from Caley Jags, and the Bristol-born defender is relishing his new challenge. Warren said: “I’m back home to the south west. It’s good to come back and to have been given a chance to come and play for Darren and for Yeovil Town. “But I’ve been in the game a long, long time to know what it takes to be successful. I’m not coming here to just think it’s a chance to come and play, I’m coming here to win things and try and take this club forward and be as successful as we can.